As we begin the hot summer months, North Carolina Democrats have acted to prevent working families from receiving much needed relief at the gas pump. State taxes were scheduled to drop 2 cents on a gallon of gas in July. So what did N.C. Democrats do? They stopped it from happening. That would be against their apparent policy preference when it comes to taxes: not a dime left behind. Democrats also put in place new legislation to prevent any relief for consumers through 2011, likely as a precursor to eventually raising the gas tax. RALEIGH, N.C. -- Lawmakers gave final approval Monday night to change North Carolina's gasoline tax, three years after their decision to cap the tax pleased motorists but sent road-building revenues nearly a half-billion dollars lower than projected. The bill passed the House by a 64-52 vote and is likely to be signed into law by Gov. Beverly Perdue. It would mean taxes at the pump won't go down 2 cents a gallon to 27.9 cents on July 1 as expected under current law. N.C. State University's Board of Trustees has terminated the contract of Mary Easley. The trustees said the duties of Easley's job no longer exist and her departure from N.C. State would be in the best interest of the university. New documents show that the Mary Easley job at N.C. State University was orchestrated at the highest levels of state government, and included the direct involvement of then-Gov. Mike Easley. E-mail messages show the creation of the job for Mary Easley was orchestrated in April and May of 2005 by the governor and that her job formation also included his wife, Mary; the chancellor at N.C. State, James Oblinger; a key trustee, McQueen Campbell; a senior adviser to Easley who now heads the Golden Leaf Foundation, Dan Gerlach; and an NCSU lobbyist at the time, Andy Willis. Until now, officials have all denied any involvement in the hiring other than by former Provost Larry Nielsen, who the records show was also involved in creating the position that gave Mary Easley an $80,000, three-year contract to oversee a speakers series and help teach a class. New documents released by N.C. State University officials as part of a federal investigation show that former Governor Mike Easley and members of his administration were directly involved in the creation of a position for his wife and her subsequent hiring by the university. In addition, N.C. State Chancellor James Oblinger resigned today on the heels of weekend reports in The News & Observer that he misled the public regarding the size and length of the severance package given to former N.C. State Provost Larry Nielsen. President Ronald Reagan, in a way unlike anyone else, defined what it meant to be a Republican and a conservative. President Reagan faced every crisis with dignity, optimism, a belief in the inherent righteousness of the American ideal, and a belief in the enduring goodness of the American people. There is no better way to honor the man than to study the timeless truth of the principles he espoused during his lifetime. This passage comes from a section of President Reagan's First Inaugural Address delivered on January 20, 1981. "Idle industries have cast workers into unemployment, causing human misery and personal indignity. Those who do work are denied a fair return for their labor by a tax system which penalizes successful achievement and keeps us from maintaining full productivity. In this present crisis, government is not the solution to our problem." Congressman Mike Pence (R-IN) will speak to North Carolina Republicans during the 2009 NCGOP Convention held June 12-14 at the Raleigh Convention Center. Congressman Pence will be a special guest at the evening banquet on Friday, June 12. Pence was first elected to Congress in 2000 and was most recently elected to a fifth term in November of 2008. He also was elected unanimously by House Republicans to serve as House Republican Conference Chairman in November 2008. In his role as Conference Chairman, he helps to develop and disseminate the message of the Republican Conference and to promote its members. Congressman Pence describes himself as "a Christian, a conservative and a Republican, in that order." “We are incredibly pleased to have Congressman Pence join us as a special guest and speaker at our 2009 convention. Congressman Pence is not only a visionary and a bold advocate for conservative principles, but he is also a man of great humility and integrity. We are honored to have him as a guest in North Carolina and look forward to hearing him cast a vision for making our party stronger and better." RALEIGH— At a meeting today, Terri Lomax, vice chancellor for research and graduate studies at N.C. State University, announced a moratorium on the creation of new academic centers. This announcement will have a direct impact on the job of former first lady Mary Easley. When Easley was promoted and given a five-year contract and an 88-percent raise last year, her new duties included creating the Public Safety Leadership Center at N.C. State. That center will no longer be created, and therefore, one of the substantial portions of Mary Easley's $170,000 a year job will not be performed. It is uncertain how the change will affect Mary Easley's job status. 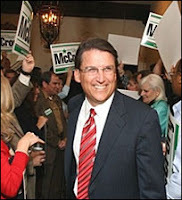 The NCGOP has begun the "Perdue Watch" on its Seeing Red Again blog to mark the time that Governor has been watching instead of acting to end the Mary Easley scandal. You can view the blog here. "It has been more than nine days since this issue first came to a head and calls for Mary Easley's resignation began piling up. Governor Perdue has refused to do anything about the situation but watch from the sidelines while tolerating corruption and mismanagement of taxpayer money. It was outrageous to spend $850,000 to pay Mary Easley to create the center. It is incredulous that the state would pay Mary Easley $850,000 to not create the center while public school teachers are taking a pay cut and resources are being drained from our children's classrooms. For Governor Perdue and Democrats in the General Assembly to ask teachers and students to bear the burden of a $4 billion budget deficit while they continue to protect the Easleys proves just how out of touch they are with the challenges facing North Carolina's working families. Governor Perdue can act to end this scandal or she can continue to watch it happen. It's her choice."